First of all, thank you! We were not expecting the 50 Founders Club memberships to sell out in less than a day! It was amazing to see club memberships and merch sales go to so many familiar names: high school friends, bottle share friends, homebrewers we’d emailed with for years, but also so many more names we didn’t recognize. We appreciate the trust so many people placed in us. There are still plenty of the two individual clubs spots available as well as merch, a chance to brew with us on the big system, join a blending panel, or a web chat all in the webstore! Scott’s cousin Andrew has been keeping an eye on Quickbooks for us, he was pretty surprised when the balances started looking rosier all of a sudden last Thursday! The cash infusion from online store helps to restore the buffer we’d been chipping away at thanks to a few big expenses (like needing to change the planned location of the glycol chiller from the roof to a concrete pad in the back) and lots of small things that we failed to account for like a six-week delay due to an unexpected zoning change. Hopefully, if things go smoothly over the next few weeks we’ll be able to start brewing in August and selling beer from the tasting room in September! The biggest news for July is that we can finally announce our first employee: taproom manager Spencer Love. He has many wonderful attributes, but the most important for us was that he is a Howard County registered voter (a requirement in his role as Resident Agent for our liquor license). We couldn’t be happier that we had to hire someone though because Spencer brings years of experience running front-of-house operations for bars and restaurants (a skillset the two of us are sorely lacking). 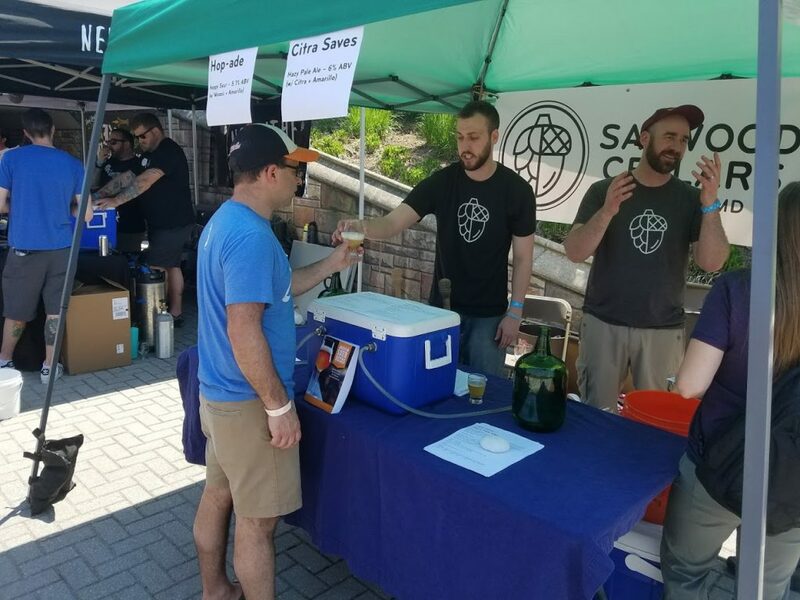 Spencer is also a beer nerd and enthusiastic homebrewer (he showed up to his interview with bottles of dry-hopped white-wine-grape pale sour, and a saison on second-use fruit). We’ll put his palate to use on tasting panels, and his vast beer knowledge to use educating the staff and those coming into the tasting room. We’ll also let him loose on the pilot system… once we get one! I’m a local kid. I moved to Howard County when I was 8, truthfully, I didn’t have much say in the matter, but I went to River Hill High School, built the outdoor classroom at Glenwood Middle School for my Eagle Scout Project, and now that I think about it, I don’t think I’ve ever received a paycheck outside of HoCo, most of which have been from the restaurant and bar industry. My affinity for craft beer began when I joined a local bar’s Beer Club after some quick mental math made me think, “That discount for finishing makes bottles of Bud Light how much?” About a quarter of the way through I was hooked. Ever since then my focus personally and professionally has always had a sort of “brew related skew”, be that educating staff/guests on the draughts and bottles we had decided to carry or my personal homebrewing experiences. It has all lead me here, Taproom Manager, Bar Czar, Beer Cavalier, or just the Draught Beer Cashier of Sapwood Cellars. I am focused and excited to cultivate an environment where we can explore the wonderful world of beer together. My favorite person is the one that is adamant that, “[they] don’t like beer.” With the range of styles, ingredients, and techniques, to me it’s like saying you don’t like food, let’s talk, there’s beer out there for you, I promise! I want the Sapwood Taproom to be a place for people who say, “beer fills me up” all the way to the avid homebrewer who wants to discuss the merits of heterofermative lactobacillis in sour worting given their setup, but mostly we want you to have a good time with us. I am fully committed to this project, to this community, and to you. My email is Spencer@sapwoodcellars.com, our phone number is (443) 542-9304, reach out with what you want to see next in our adventure together, I can’t wait to get out there! We’re looking forward to hiring the rest of the tasting room staff later this month! Keep an eye on our website and on our social media for the job postings. We aren’t planning to hire on the brewery-side for now, but we will need some help before too long! 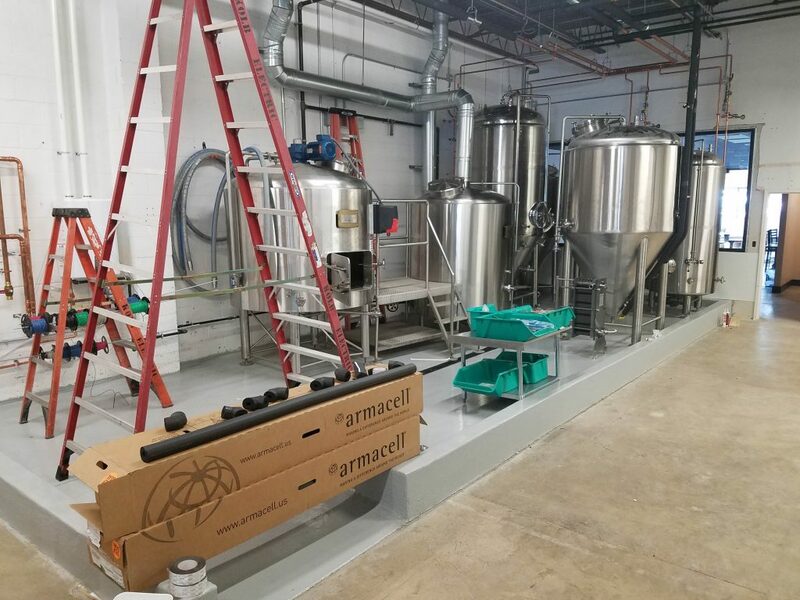 July saw plenty of progress, held back in small, but significant ways… The glycol piping is connected to the fermentors, with solenoid valves and probes that will precisely control the temperature of our beer… but the glycol chiller itself doesn’t arrive until this week. The water, vents, and gas are all connected to the brewhouse… but we are waiting on our local supplier to install a higher flow-rate gas meter so we can get the wort to a rolling boil. We were granted our liquor license… pending a review of our impact on parking and traffic to update the 1979 Site Development Plan (the unexpected zoning change mentioned above). Big announcements coming soon about barrels, the opening-day beer lineup, soft opening, and more!